Aleu woke up and saw Austin. "Good morning. "She said and nuzzled him. "How did you sleep? "She yawned. Jenna woke up.Balto was sleeping so she didnt want to wake him up.She waited for him. BAlto woke up an hour later He saw jenna resting Hey Jenna He said quietly Are you up? Austin licked Alue on the cheek and then saidso feeling awake or want to sleep more? Aleu smiled. "No, Im awake now. "She said. "Im on. "Jenna said and stood up. "Listen Balto...lets forget yesterday okay? "She said and nuzzled him. 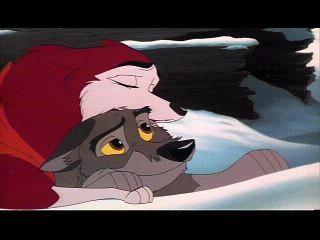 Balto said Yes Lets I will never bring it up again! Austin smiled He licked her cheek then said what do you think we should do. Should we tell your dad that we are or might be having pups? Jenna smiled and nuzzled BAlto. "Im glad daer. "She said. "Lets go on a walk." Aleu smiled. "I think you will be a father. "She smiled and licked his nose. Balto said Ok He followed Jenna and wondered where they were going and why?So where are we going?